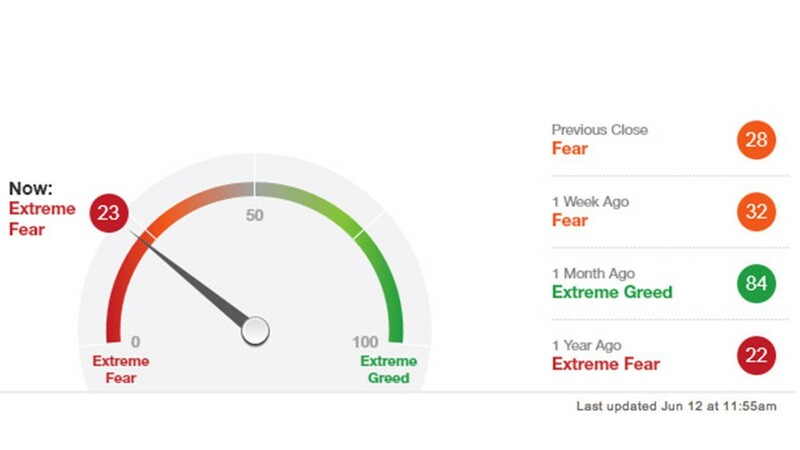 Another snapshot of volatility, CNNMoney's Fear and Greed Index has swung from extreme greed to extreme fear in just a month. Volatility and fear are back with a vengeance on Wall Street. During the past month, investors have been on a roller coaster ride. Worries about when the Federal Reserve and other central banks might cut back on their stimulus plans have frayed some nerves. The Dow has swung more than 100 points during seven out of the eight trading days so far in June. Compare that with January, when the Dow had only four 100-point moves during the entire month. CNNMoney's Fear and Greed Index has also been whipsawed, sliding into extreme fear for the first time in a year Wednesday. Just a month ago, the index was sitting comfortably in extreme greed. And a key metric for measuring market volatility -- the Chicago Board Options Exchange's Volatility Index (VIX) -- has been on a tear. During the past six weeks, it's spiked nearly 42%. That's quite a move for the VIX, which currently trades around 18. While it still has a ways to go before signaling high levels of fear, the sharp rise suggests the volatility plaguing Wall Street is here to stay. "We're moving into a new era of volatility," said Jamie Tyrrell, a VIX trader at Group One Trading. He says investors should brace themselves for a prolonged period where the S&P 500 and the Dow could have some big daily swings of 1% or more in any given week. What's behind the churning? Central bankers. Investors have had the Fed, the European Central Bank and the Bank of Japan to thank for this year's big run-up. Unprecedented levels of bond buying by the central banks have helped boost stocks, which are up roughly 15% this year, and until recently helped push interest rates to record lows. Now investors worry that central banks could shift from being a friend to the market to a foe. Many analysts have compared central bank intervention to a drug that investors have become hooked on. They're starting to come to terms with what withdrawal might feel like. The yield on the benchmark 10-year U.S. Treasury note jumped to 2.2% from 1.6% in mid-May. Currency traders have watched the yen move up and down at a frenetic pace, along with Japan's stock market. Jim Strugger, a derivatives strategist at MKM Partners, thinks that volatility will remain heightened but won't reach crisis-era levels. During 2008, as investors worried that the global financial system might collapse, the VIX spiked as high as 60. It also rose above 40 after the S&P downgraded the U.S.'s credit rating. No one expects it to get near those levels anytime soon.